Chief Master Sgt. Richard L. Etchberger distinguished himself by extraordinary heroism on March 11, 1968, in the country of Laos. While assigned as Ground Radar Superintendent, Detachment 1, 1043rd Radar Evacuation Squadron. On that day, Chief Etchberger and his team of technicians were manning a top-secret defensive position at Lima Site 85 when the base was overrun by an enemy ground force. Receiving sustained and withering heavy artillery attacks directly upon his unit’s position, Chief Etchberger’s entire crew lay dead or severely wounded. 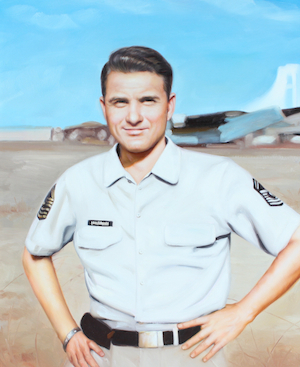 Despite having received little or no combat training, Chief Etchberger single-handedly held off the enemy with an M-16, while simultaneously directing air strikes into the area and calling for air rescue. Because of his fierce defense and heroic and selfless actions, he was able to deny the enemy access to his position and save the lives of his remaining crew. With the arrival of the rescue aircraft, Chief Etchberger without hesitation repeatedly and deliberately risked his own life, exposing himself to heavy enemy fire, in order to place three surviving wounded comrades into rescue slings hanging from the hovering helicopter waiting to airlift them to safety. With his remaining crew safely aboard, Chief Etchberger finally climbed into the evacuation sling himself, only to be fatally wounded by enemy ground fire as he was being raised into the aircraft. Chief Etchberger’s bravery and determination in the face of persistent enemy fire and overwhelming odds are in keeping with the highest standards of performance and traditions of military service. Chief Etchberger’s gallantry, self-sacrifice, and profound concern for his fellow men, at risk of his life, above and beyond the call of duty, reflect the highest credit on himself and the United States Air Force. My father was killed on a Top Secret mission that was kept under wraps for more than 40 years. This is my way of honoring him by using the family's favorite picture of him with the Air Force Medal of Honor finally draped around his neck. No, its not that I'm slow in answering your letter - I just got it yesterday. Took a while in catching up to me. Buddy, it sure was good to hear from you and I certainly feel good that you took the time to write such a lengthy and informative letter. I'm glad to hear that you're finally settled with the family and into another job. As far as mailing those packages you ask about, send them to Kay in Pennsylvania. That's right - she's there with the boys living in my hometown and I'm in Udorn, Thailand. It's a very long complicated story - I wasn't shafted - I volunteered - fortunately Kay understands me and she was for it and that sure helps. Fortunately too, the gods chose to smile on me and I was picked for a special project at Bolling Air Force Base, Washington, DC to this unit to do some radar work. I volunteered for the job and here I am. It is the most challenging job I'll ever have in my life - I love it, travel all the time - hate to be away from home - but believe in the job and as I said just love it. Well Ed, hope this finds you and family well and ready for a merry and happy holiday. My best to the wife. No rush on the package - after the holidays is fine. Let me know the cost - ah yes, if there's anything I can get you from Thailand let me know - be glad to try.